The role of the Volume Amplifier is that you can put the volume slider in the main interface pulled to the highest. 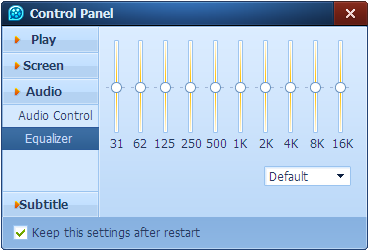 But, if the further amplified sound is still not loud enough, you can turn the volume to the maximum 10 times. Drag the slider, wait a few seconds and feel the volume amplification effect. Channel Balance allows you to select a two-channel sound output size; drag the slider to feel the effect of the changes in the volume of both channels. The Audio Synchronization function is used during playback when you find the picture and sound are not synchronized. You can first select the screen to adjust the sound according to the situation of sync unit (0.1 seconds, 0.5 seconds or 1 second), then click on the left and right arrow buttons to adjust the sound and picture synchronization process. Click on the Reset button to restore to its original condition. Drag the slider to set the appropriate effect sound output, or select a preset mode directly in the drop-down menu in the lower right corner.